Did you ever wonder how Las Vegas, a glittering city of lights and non-stop entertainment got started in the middle of an empty dry desert? Below is a brief history that explains it all. Early 1700’s 1844 – Famed explorer Captain John Fremont writes about Las Vegas – bringing the valley to the attention of others besides the Spanish explorers and missionaries and the indigenous Indian population. Brigham Young assigns 30 Mormon missionaries to build a fort in the Las Vegas valley. The fort constitutes the first non-Indian settlement in the region and is still located on the corner of Washington Avenue and Las Vegas Boulevard. Their primary purpose is to teach the Paiute Indians farming techniques. The Paiutes reject the teachings and occasionally raid the fort. 1855 1857 – Bringham Young’s fort is abandoned The discovery of minerals, including precious metals, leads to the beginning of the mining industry. The completion of the main railway, linking Southern California with Salt Lake City, establishes Las Vegas as a railroad town. The availability of water makes Las Vegas an ideal refueling point and rest stop. The railroad is the principal industry in Las Vegas for the next 25 years. 1905 1909 – Las Vegas becomes the county seat for the newly established Clark County. Until now, the city is governed as part of Lincoln County. 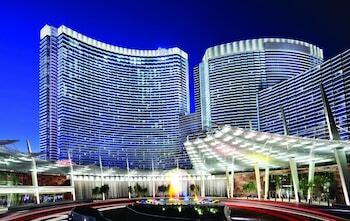 Las Vegas becomes an incorporated city and adopts its first charter on March 16th. At the time of incorporation, the city encompasses 19.18 square miles, and has approximately 800 inhabitants, less than 1 percent of the states total population. Clark County has a population 3,321. On March 19th, gambling is legalized in the State of Nevada. One month later, the city issues six gambling licenses. Divorce laws are liberalized in the State of Nevada, making residency easier to attain. A “quickie” divorce can be attained after six weeks of residency. These short-term residents stay at “dude ranches” which are the forerunners of the sprawling Strip hotels. 1911 1930 – Las Vegas grows to a population of 5,165. Beginning in 1931, the construction of Hoover Dam brings an influx of construction workers which starts a population boom and gives the Valley’s economy, which was in the grips of the Great Depression, a needed boost. 1931 1935 – Hoover Dam is complete. Las Vegas’ population has grown to 8,422. The outbreak of World War II brings the defense industry to the valley. The isolated location, along with plentiful water and inexpensive energy, makes Las Vegas an ideal site for military and defense related industries. The site for Nellis Air Force Base is located in the northeast, and the Basic Management Complex, providers of raw materials, is located in the southeastern suburb of Henderson. The defense industry continues to employ a significant number of valley residents. 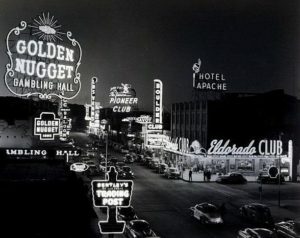 1957 1959 – “Welcome to Fabulous Las Vegas” sign is created by Betty Willis. 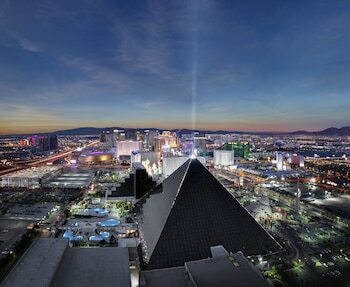 Las Vegas encompasses 25 square miles and has a population of 64,405. Las Vegas has more than 22 percent of Nevada’s total population on less than .02 percent of the State’s land. At the same time, Clark County has a population of 127,016. Las Vegas hosts its first boxing match. 1960 1960’s – During the 1960s, a phenomenon lead by Howard Hughes, occurs in Las Vegas. Corporations are building and/or buying hotel/casino properties. They have the capital necessary and the profitability makes entrance into the casino industry extremely attractive. Gambling becomes “gaming” and starts the transition into legitimate business. 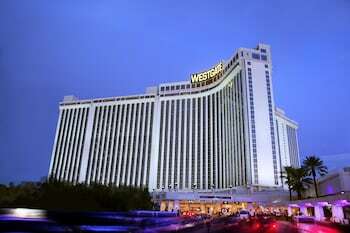 Elvis Presley opens at the International Hotel, now known as the Las Vegas Hilton. 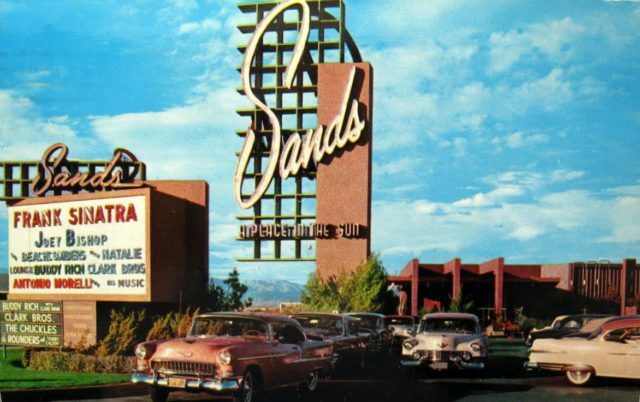 1969, 1970-1980 – Corporations continue to invest in the hotel/casino industry. Gaming becomes a legitimate business and some properties have stock traded on the market. Las Vegas economy remains strong and the population increases to 164,674. Clark County, meanwhile, grows to a population of 463,087. 1980 1980’s – Starting in the mid 1980s, a period of unprecedented growth begins. Annual population increases averaging nearly 7 percent causes the city’s population to almost double between 1985 and 1995, increasing from 186,380 to 368,360, a 97.6 percent increase. That is equivalent to building a city larger than Reno in 10 years! At the same time, Clark County’s population increases from 562,280 to 1,036,180, an increase of 84.3 percent. 1993 -T he Dunes Hotel implosion. Contributing to the population growth is a 4 percent annual increase in hotel rooms and a 9.18 percent annual increase in jobs 1990’s The US Census reports the population of Las Vegas is 478,434 over a land area of 113 square miles. There are over 500 churches and synagogues, 799 acres of parks, 7 television stations, and 12 radio stations (4 AM and 8 FM). 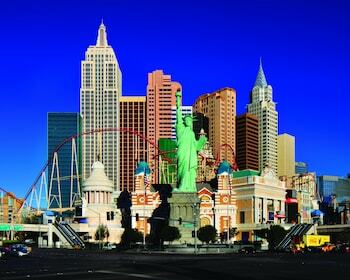 Las Vegas is the largest metropolitan city in the U.S. that was founded in 20th century. 2000 2016 – The city of Las Vegas celebrated its 100th birthday on May 15, 2005. The events celebrated the May 15, 1905 auction in which 110 acres of downtown Las Vegas laid the foundation for the city we know today. 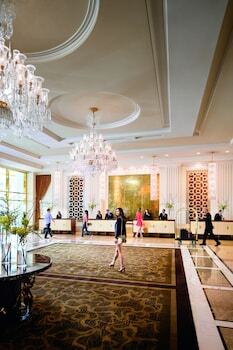 In 2005 Wynn Las Vegas opened for business. This was followed by Palazzo and Encore in 2007/2008. 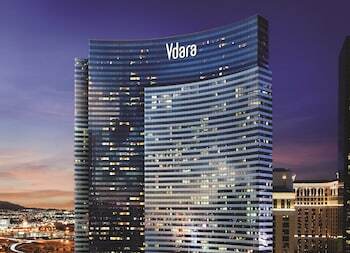 2009 saw the opening of CityCenter with Aria, Vdara and Cosmopolitan coming up later.